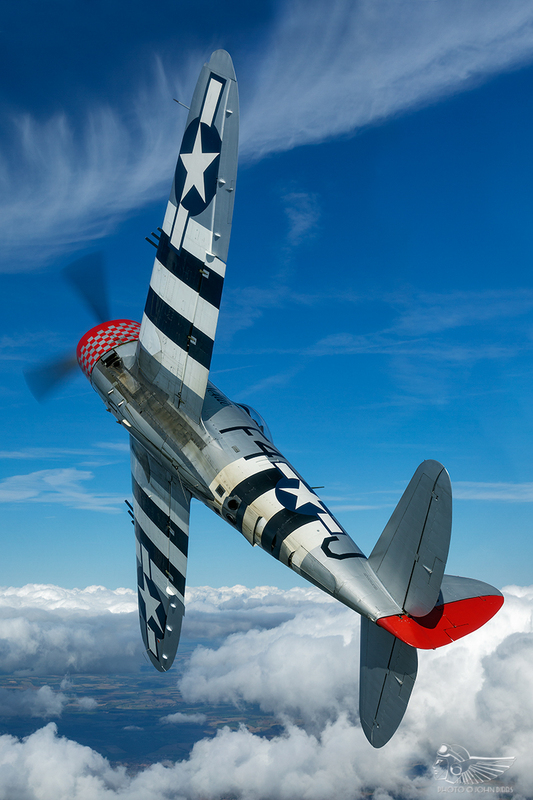 P-47 Thunderbolt G-THUN, a former flagship of The Fighter Collection, departed the UK for a new life in the USA in 2007, its sale heavily felt by those who flew it and those who enjoyed seeing it fly alike. In subsequent years Richard set up the burgeoning Air Leasing facility at Sywell, restoring, maintaining and operating a raft of vintage aeroplanes for third party owners. 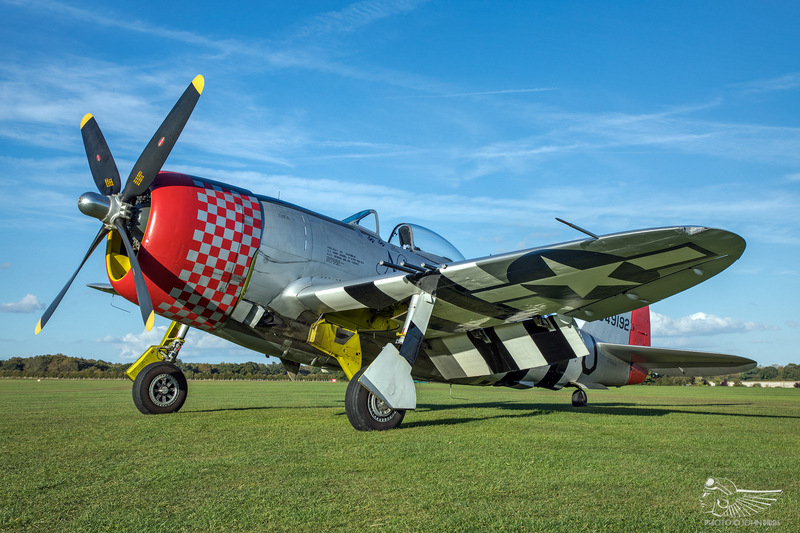 As of early 2019, he has around 500 hours on high-performance piston warbirds, including the Sea Fury, Mustang, Buchón, Spitfire and Hurricane. The Thunderbolt’s acquisition by Fighter Aviation Engineering Ltd heralded its much-anticipated return to the UK, and shipment to the UK in a 40-foot container followed in spring 2018. Air Leasing reassembled the aeroplane at Sywell and 12 days after arrival it was rolled out, resplendent in a new paint scheme representing F4-J Nellie (updated in winter 2019 to Nellie B on the basis of new photographic evidence) of the 492nd Fighter Squadron, 48th Fighter Group, 9th Air Force. 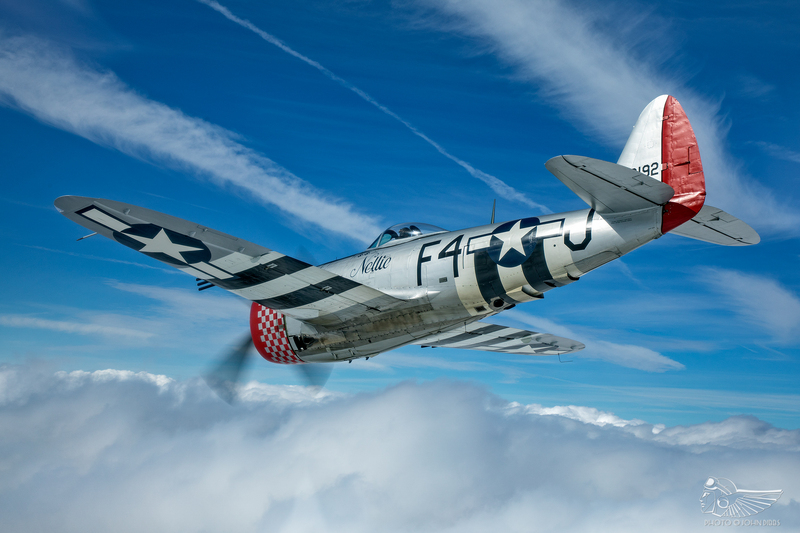 The P-47 flew again on 4 May, with Pete Kynsey at the controls. 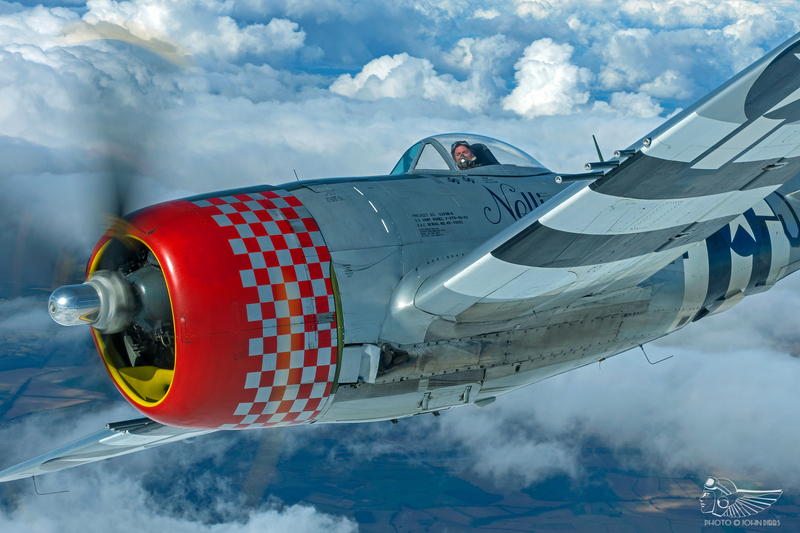 From the pilot’s perspective, the most involved element of any Thunderbolt pre-flight is manually turning the four-blade Hamilton Standard propeller through 18 blades to redistribute settled oil throughout the 18 cylinder Pratt & Whitney R-2800-51M1 engine (that powerplant coming from a C-46 Commando and having marginally different engine parameters to a stock Thunderbolt’s R-2800) before start-up; a strenuous task for pilot and ground crew, particularly on a hot day. With the 28 gallon oil tank positioned above the engine and lacking a shut-off valve, gravity will draw oil down into the engine over time, settling in the intake pipes or the combustion chambers of the lower cylinders. As oil is incompressible, and its pooling in the lowermost cylinders can stop the respective piston on the compression stroke as the engine fires, a process colloquially known as hydraulic locking, potentially causing critical damage to the respective cylinder or connecting rod. Whilst in the USA, Nellie B was mated with a radial oil clean kit which incorporated an electric shut-off valve for the oil tank, with a scavenger pump cycling oil from the engine back into the tank. That modification, Richard says, vastly reduces the possibility of hydraulic locking. 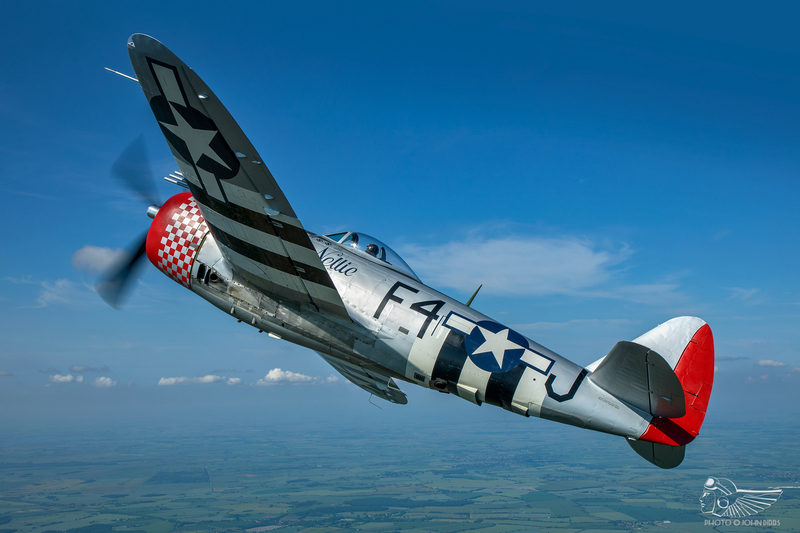 “If you’d gone from a Spitfire to a Thunderbolt, as the US Eagle Squadron pilots did in the Second World War, climbing into the P-47’s cockpit for the first time would feel like a big step up”, Richard says. The Thunderbolt’s pilot sits high in the broad cockpit at a “surprisingly upright angle”, he says. “It feels like sitting on a kitchen chair!” The cockpit layout itself is fairly standard, with a few idiosyncrasies specific to the P-47. 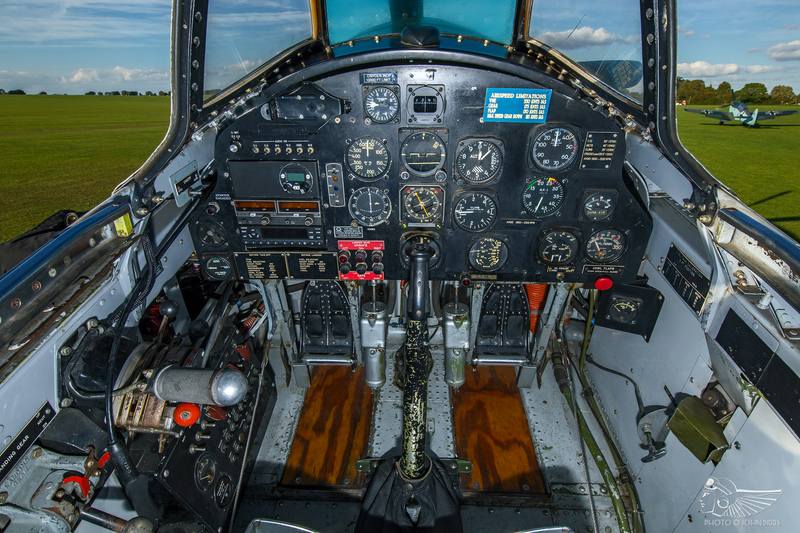 Flight instruments are clustered centrally on the panel, with engine instrumentation sat on the right, the manifold pressure and tachometer positioned most prominently. Cylinder head, carburettor and oil temperature gauges, and the oil and fuel pressure indicators are clustered furthest right. Positioned alongside the pilot’s left thigh is a panel containing the numerous electrical switches and circuit breakers. A quadrant to their immediate left contains the throttle, propeller pitch and mixture levers. Aft of this sit the landing gear and flap control levers, each set at an angle of 90 degrees from each other to avoid in-flight confusion, the fuel tank selector, and the trim controls. To the pilot’s right is the tail wheel lock. Prior to start-up, the oil cooler shutters and the cowl flaps are opened, with the throttle cracked by around one inch. Working forward from the rear port side of the cockpit, the undercarriage lever is checked in the Down position and the wing flap control handle moved full forward; the hydraulic system, pressurised by an engine-driven pump, actuates the wing flaps, cowl flaps and landing gear, and accordingly the wing flaps will raise once the engine has started. The fuel tank selector is then checked, and should already be set to the main tank – the Thunderbolt is only flown with its main tank fuelled (to a maximum capacity of 1,066 litres), and the fuel is usually left on to keep the carburettor lubricated to avoid the seals drying out.  Moving forward to the throttle quadrant, the propeller control is set full forward and the mixture checked to be in Cut Off. The generator and fuel booster pump are both switched on, and fuel pressure monitored. At the hold point, Richard will position the aircraft downwind or side-on to the prevailing wind for the power checks; this avoids air cooling the engine and allows the cylinders to sufficiently warm up. Moving the mixture into Auto Rich, he will slowly advance the throttle to 1,800 rpm and check the magnetos, looking for a drop of no more than 100 rpm. “The engine is so far away and on such a smooth mount that it’s very hard to hear a mag drop”, he adds. “It’s unusual in that the rpm gauge will be the only way of knowing whether you’ve lost a magneto.” Richard will then cycle the propeller control lever from full forward (fine) to full back (coarse) three times to run hot oil around the propeller components and improve their responsiveness. Throttle is then advanced to 1,000 rpm to avoid fouling the spark plugs whilst the final instrument checks are carried out, and the cowl flaps and oil cooler door opened half way. “At that point I put my right hand on the tail wheel lock,” says Richard, “because I don’t want to forget that. It taxies well at 1,000 rpm so I can leave the throttle and have my left hand on the stick with the other on the tail wheel lock until I’m lined up on the runway. You then increase the throttle to 30inHg (“) and release the brakes as you continue to increase the power. The second it lurches forward, it feels like it slows down! You advance the power to 50″, checking the temperatures and pressures intermittently, and the airspeed and rpm will slowly build it until the aeroplane flies itself off the ground”. He describes the take-off run as a docile affair, largely due to the aeroplane’s sheer mass and the enormous gear track (around 18ft) that precludes the need for torque-counteracting rudder or opposite aileron input. “As the power is set and I’m rolling, I’ll move my hand to the gear selector and once I’m satisfied it’s airborne, I’ll pull the wheels up within around ten seconds”, Richard explains. The gear is retracted by depressing the button at the end of the selector lever with the left thumb and pushing down to release the lock before raising. “At the vast majority of airfields in the UK, the runway is of a length that if you lose the engine on take-off, you won’t be able to get back on the ground and stop the aeroplane before running out of runway. You’ll end up going through a hedge and into a field, which will take the gear off and you’ll likely come to grief too. I know what it takes to repair an aeroplane that has had its gear torn off, and if that happens, it’ll be on the ground for a very long time. Even if the gear is transiting as the engine quits and you end up in a field, you’ll have lessened the damage. That’s why I get the gear up immediately – it’s risk mitigation. The gentle climb at 42″ and 2,400rpm is a pedestrian affair. Once in the cruise, the cowl gills are closed (via a choke lever on the bottom right of the instrument panel) to reduce drag and avoid excessive cooling. 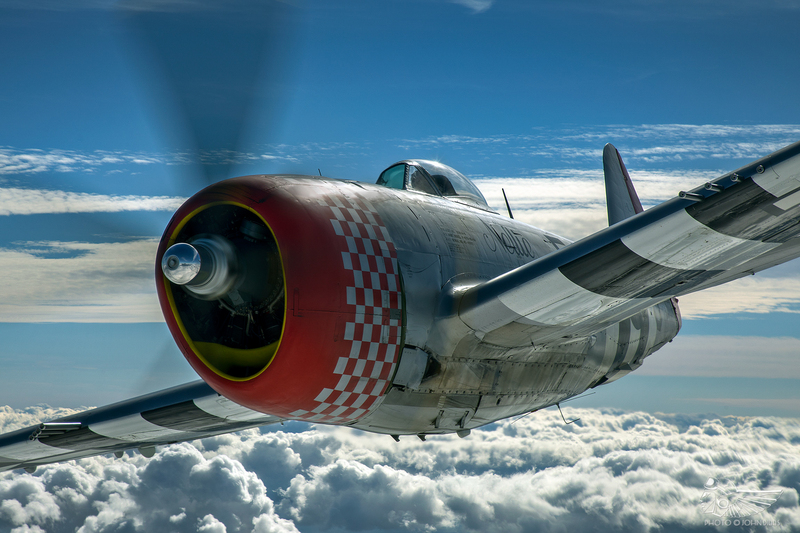 With power settings of 35-40″ and 2,000 to 2,200 rpm, the P-47 should cruise at 210kts – “sprightly for a biggun!” – with the CHT sat at 150-180°C, oil temperature hovering around 70°C (regulated by operation of the oil cooler shutters via a switch on the main instrument panel) and the oil pressure pegged at 90psi. The physical air temperature in the cockpit is very high at all times of the year, the air vents doing nothing but “blowing hairdryer hot air into your face”. The Mustang, by comparison, takes cool air from the radiator scoop and pumps it up through the back of the canopy and down onto the pilot’s face. “No such luxury in the Thunderbolt!”, laments Richard. Positioning the Thunderbolt for an aerobatic display practice at Duxford, the aeroplane’s summer base, Richard will climb to 4,500ft (just shy of Stansted airspace), maintain climb/aerobatic power of 42″ and 2,400 rpm and fly large circles until the aeroplane is going as fast as it can achieve in level flight at that power setting. “I’ll then start a very steep descent towards the airfield”, he says. “In a Spitfire, that would be near vertical – in the Thunderbolt I’m lessening that angle slightly due to the weight of the thing, but the objective is to fly the aeroplane as fast as it will let me go.” That has the P-47 screaming over the airfield at low-level and at least 320kts (368mph) for the first pass of the routine. 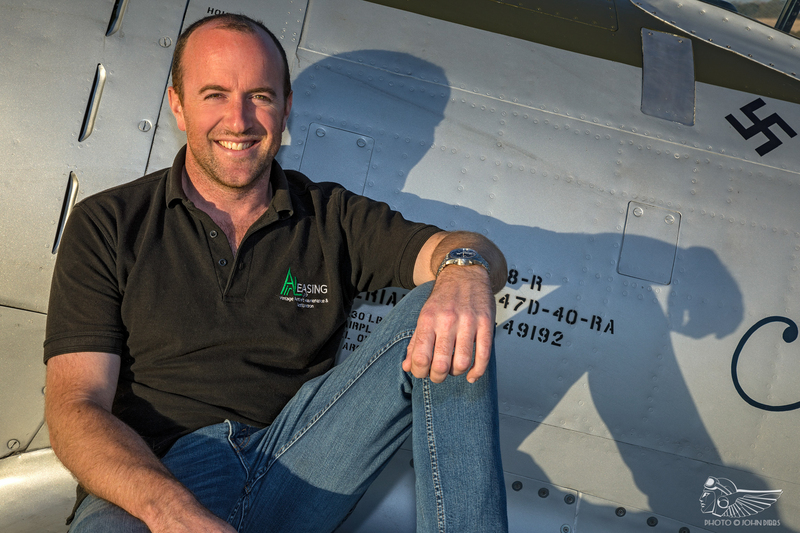 On the climb into the vertical, Richard will be closely monitoring the oil temperature and pressure; a habit he taught himself early on, and one honed when flying the Sea Fury, where oil pressure is checked every 30 seconds. “It’s good practice to monitor engine parameters in the climb rather than staring blankly at the altimeter”, he says. “If the engine’s going to fail, I want to know at the top of the manoeuvre to give myself maximum altitude to work with.” In the climb, gyroscopic forces react to the right-turning propeller by yawing the aeroplane to the left; that gyroscopic precession is particularly pronounced in Second World War fighters with high propeller rpm. “You’ll instinctively be applying rudder as you enter the manoeuvre to counteract the torque and avoid the yaw washing the airspeed off, easing the pressure off until your feet are both central in the early stages of the vertical pull before feeding in opposite rudder to keep the aeroplane in balance as the airspeed decreases. It is a permanent battle in the high-performance warbirds, and if you left your feet in the centre it’d be pretty exciting. In the Mk.XIV for example, it’s laughable. Loads of rudder pressure on the way in, then through the vertical it’s almost an immediate change to the other foot and at the apex of the vertical figure, you’ve got full rudder on just to barely keep it in a straight line. “I construct my vertical display routine around gate airspeeds”, Richard explains. 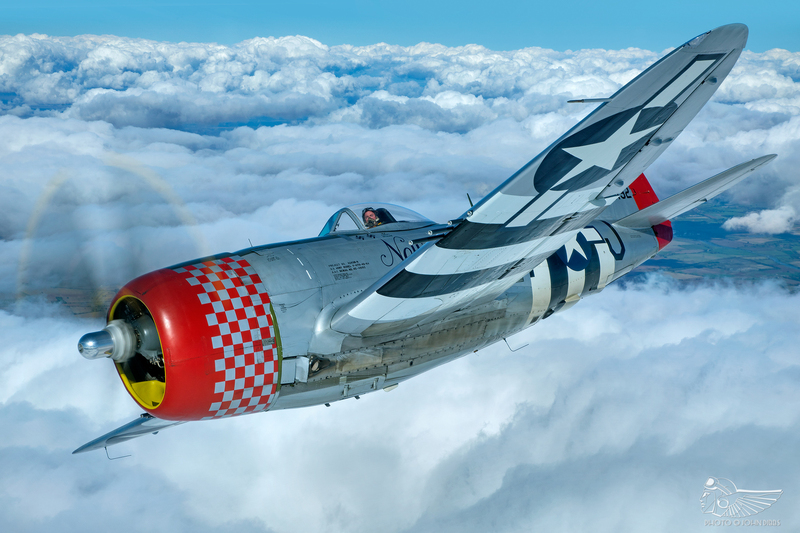 “I know what airspeed I entered the figure at, and I know that if I’ve applied the right amount of elevator on the pull-up, the Thunderbolt will be at 100-110kts at the apex of the loop. Regardless of the entry airspeed, I’ll aim to keep that over-the-top airspeed consistent by adjusting the amount of elevator input in the first half of the figure. I always start with a vertical climb and a half-roll, followed by a loop; what happens next depends on the type. I know that at my entry airspeed, the reverse cuban will give me enough altitude to recover, and it’s the loop that’s key. 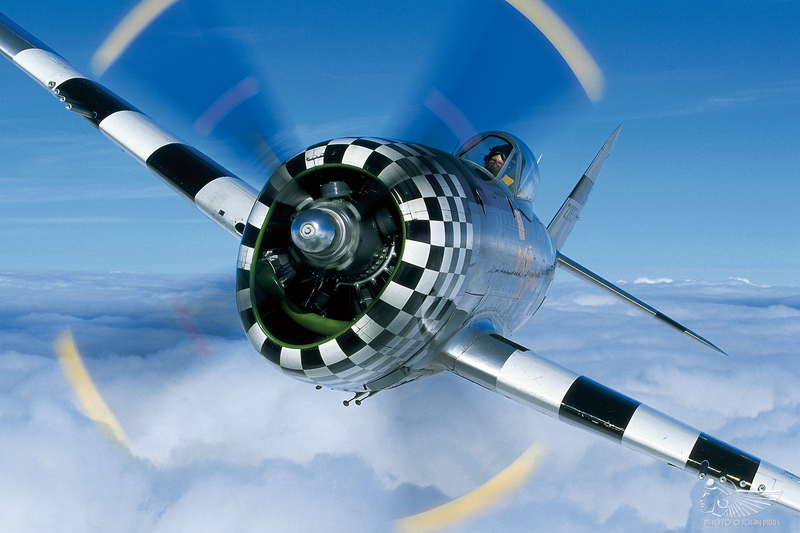 In the P-47 I’ll only loop early on in the display when the airspeed and energy are at a premium. For that reason, I’m usually only checking my gate entry airspeeds for the first two figures, as that’s where I need to exercise caution. As the airspeed and energy bleed off, vertical manoeuvres give way to rolling figures and topside passes. The ailerons are very good for an aeroplane of its size, and need little application force – around half of the stick’s travel – to initiate a rapid rate of roll. Breaking into the circuit after a sortie and pulling the power back (reducing rpm before manifold pressure to avoid the propeller driving the engine), the airspeed should decay fairly rapidly. A high gear and flap limit of 170kts allows early onset of drag in the downwind, albeit Richard cautions that the Thunderbolt will not maintain level flight with the gear and flaps down in a turn, even at full power. “If you’re turning into final, you can pile the coals on all the way to full power and whilst you’re lessening the rate of descent, you will still be descending”, he says. “That could put you in a difficult position if you weren’t awake to that fact. “If you’re turning final at 120kts, you’ll be coming over the hedge at around 100kts and you really won’t have a lot of power left. If you’re below 100kts on short final, you have to look out of the window and fly by feel alone, as the airspeed indicator won’t be of any use. Generally you’ll two-point it in a tail-down attitude, and once you chop the power to idle you know it’ll land and stay on the ground. Those huge undercarriage legs absorb the landing and there’s little risk of floating or bouncing. As with the take-off, the large gear track and mass of the thing mean it’ll sit pretty in the middle of the runway with little risk of deviations. It’s a docile affair, you just need to be conscious of the conflict between rpm and manifold pressure, and the aeroplane’s inability to climb out of a level turn with gear and flaps down.” After sitting on the ground for a few minutes to allow the CHT and oil temperature to stabilise, the engine is shut down by cutting the mixture, with the magnetos and electrics then switched off in turn. 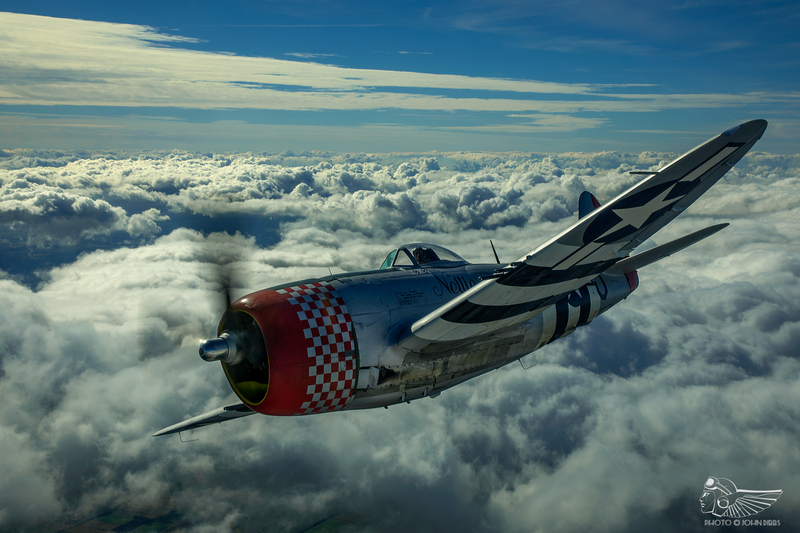 “You hear a lot about how the Thunderbolt flies like a brick, and is a bit of a freight train to handle”, Grace reflects. “Yes, it’s an enormous aeroplane and that could be daunting when you first approach it, but it’s so manoeuvrable. It’s every inch the fighter. With a light fuel load you could loop from 250kts, which is unheard of for an aeroplane of its size and weight. All these aeroplanes perform so differently, you just need to sit down and figure it out in your head, then have the opportunity to practice and really learn the aeroplane. It’s an awesome machine and down at low-level and 320kts you really get a sense of why it was such a successful ground attack aeroplane. We look after a number of ex-Fighter Collection aeroplanes and interestingly, this one came to us with more post-restoration hours on it than any of the others, which is perhaps indicative of how nice it is to fly. 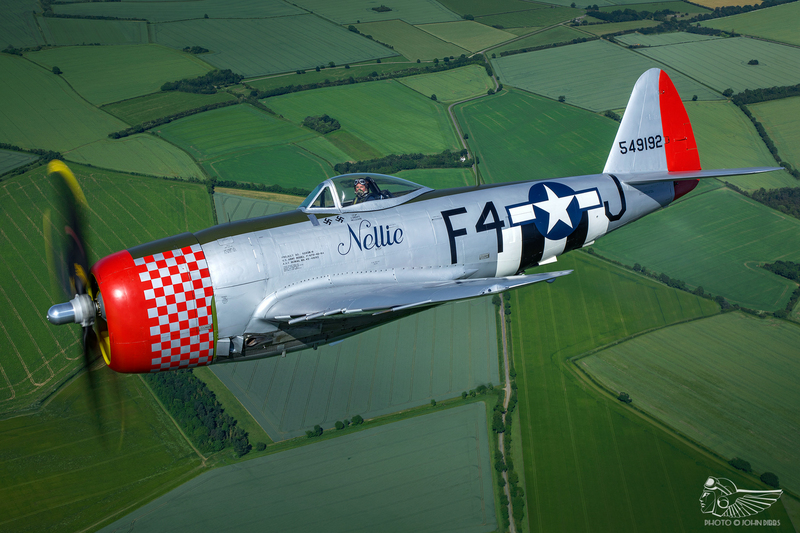 With thanks to Richard Grace and Fighter Aviation Engineering Ltd. Flights alongside the P-47 Thunderbolt, and passenger rides in Second World War fighters, are available through Ultimate Warbird Flights at Sywell.